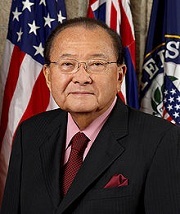 A member of this nation’s Greatest Generation, Sen. Inouye was a decorated veteran who received the Medal of Honor for his courageous service and bravery fighting tyranny and evil on battlefields across the globe. His decades of public service on behalf of the people of Hawaii were marked with passion, honor, and selflessness. He will truly be missed. Texas, the 36th ID and the 36th ID veterans should have a part in his funeral.